Visiting my neighbor Kanjin’s home last March, I noticed a small figure installed on his altar, surrounded by colorful toys and candy. When I asked, he explained the sweets on his shrine were offerings to Jizo — Buddhist guardian of lost children. The conversation blossomed into a longer talk about mizuko kuyo, a ritual that he occasionally performs as the head priest of a Buddhist temple in Seattle. The “water baby” ceremony, which originated in Japan, is performed to support parents who have lost children to tragedy and miscarriage. It allows them the opportunity to give birth to, bond with, and lay the spirit of their unborn child to rest through an act of imagining. A single wave form returns to the ocean from whence it was born — water returning to water. I walked home that afternoon thinking about the impending anniversary of the due date for the child whom I’d lost to miscarriage one year before. How there had been no time to grieve. When my first pregnancy abruptly ended around the 10-week mark, the hospital midwife dismissed the event as a “blighted ovum.” Cells failed to divide. The egg never progressed into an embryo. The technician’s wand hovered over an empty sac without a heartbeat. “There was no baby,” I explained to my Taiwanese parents, minimizing the loss to spare my family members the sadness that I carried. Deep inside, I felt the failure of language to translate physical experience. But by accepting the miscarriage as a medical event, I hoped we would all avoid grief. When I unexpectedly conceived a second pregnancy a month after my miscarriage, all attention shifted to a new life. But as much as I fell in love with my son Tomo when he was born, I couldn’t help but think about the spirit of my first child. I engaged the priest’s assistance to perform a ceremony for which we were asked to prepare offerings of toys, candy, clothing, a bottle of milk and notes to our unborn child. When I stepped into the temple on the afternoon of the mizuko kuyo, I scanned the room and realized that all of the people assisting with the ritual were men — the priest, the drummer, a chorus of male voices. I gazed out over rows of wooden tobas painted with the names of tsunami victims. Beneath the Buddhist statue seated on the dais, I counted 22 wooden boards inscribed with the names of children — the family that my own “Baby Bergman” would join. Suddenly self-conscious of feeling judged, I apologized to no one in particular that I might cry. My husband Kort, our son Tomo and I faced the altar. On a small platform, a paper doll with a painted face presided over the ritual. 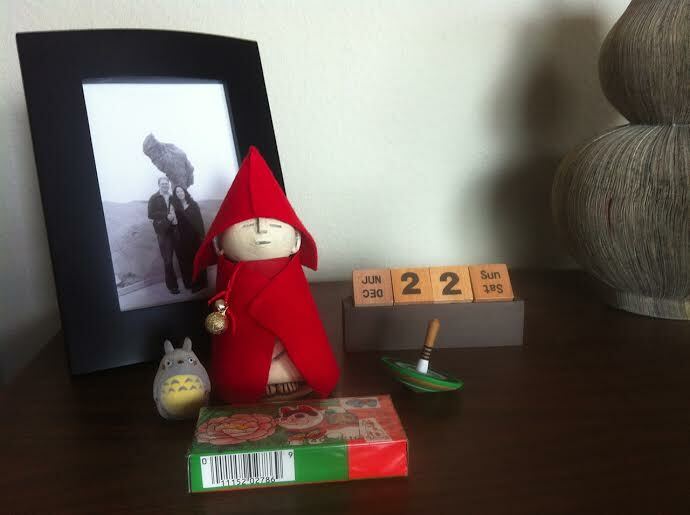 We placed a wooden top and a box of rice candy saved from our wedding nine years ago in front of the figure. After reading from the Buddhist sutras, Kanjin instructed me to “feed” the baby. Using a leaf dipped into the bottle of milk I had prepared, I touched the edge of the leaf to the doll’s mouth, reliving in my body the countless times I’d nursed Tomo over the past 10 months. When Kort touched the leaf to the doll’s mouth, its body visibly slumped towards us. Kanjin spooned the ash into the hollow Jizo statue, which I dressed in the red woolen garments that my mother hand-stitched for the occasion — a cone-shaped pilgrim’s hat and a felt cape. Inside the coat, I tucked the notes that my husband and I had written. I had composed mine several weeks earlier, requesting of Kort that he do the same. When less than a week remained before the ritual, I bluntly ordered my husband to write a letter to our “dead baby.” He finished the task the night before. Part of me wondered whether my husband would take my request to heart; our experience of mourning had been cut short by my decision to travel outside of the country with family a week after inducing miscarriage. When I returned home, Kort expressed his pain — that I had chosen to bear the experience far from him, denying him of his own grief. We had practiced a silence around our loss that grew only deeper as we focused on Tomo’s arrival. In the morning, I found his letter tucked inside a bag with our offerings. Addressed “Dear Baby,” his note expressed regret and a simple wish: “I hope you find the love you need.” More than the mizuko kuyo, Kort’s note allowed my heart release, knowing that the loss that we shared had been real to each of us. The occasion of the ceremony was simply an opportunity to put compassion into action, a poetic re-enactment of birth, love and death made more profound by those who witnessed with us and held the space. Shin Yu Pai is an award-winning poet and a contributing writer to Ballard News-Tribune, Northwest Asian Weekly, International Examiner, and Seattle Globalist. Shin Yu lives in Ballard with her husband Kort and her son Tomo. For more info on her work, visit shinyupai.com.